This entry was posted on September 28, 2010 by Alex Martel. 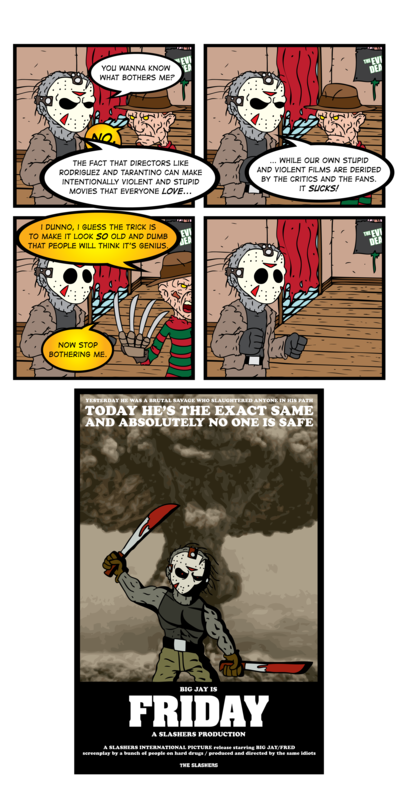 It was filed under Comics, The Slashers and was tagged with fred, freddy, grindhouse, jason, jay, krueger, machete, quentin, robert, rodriguez, slashers, tarentino, voorhees. Glad to know that. I try to be as impartial as possible. I think that all ridiculously violent yet awesome movies should be enjoyed regardless of actual quality, because a bad horror movie (I am not alluding to any particular movie) can be viewed as a comedy. And I would definitely pay money to see Friday if it starred your version of Jason.